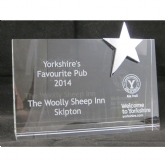 We have recently supplied glass award commissioned by Welcome to Yorkshire for the Winner of Yorkshire's Favourite Pub 2014 which was won by The Woolley Sheep Inn, Skipton. We can supply a variety of custom made awards from a simple plaque printed with an image and text mounted onto a free standing backing board, to a 20mm thick free standing perspex block engraved to your requirements or a laser engraved glass award, the various options are endless. 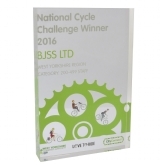 Earlier in the year we supplied acrylic shaped bicycles for the Yorkshire Bicycle Show held at the Leeds Town Hall and supplied many cycling awards and memorabilia of the Tour de France. We have also supplied Stainless steel cut out shapes of rugby balls and other types of sporting equipment which have been mounted onto acrylic bases and used for presentation evenings and award ceremonies. If you have an idea for a custom made award please contact us to discuss in more detail your requirements as the options are endless.